Day 2 : After a great traditional breakfast, you will begin a journey towards the wild and steep landscape of the Montagne Noire. There, the trees are named “mummies” because they are wrapped in a mixture of snow and ice, which creates a magic atmosphere. You will see many wild animal tracks. At the top of the mountain, if you are lucky, some Quebec grey jays will come to peck in your hand. At the end of the day, you will come back to your center where you will remove your snowmobile equipment. Drive to your Inn and have a comfort dinner and sleep. Day 3 : After you had a hearty breakfast your guide will make you discover the village of St Côme. In winter, this charming little village of Lanaudière region hosts an ice sculpture competition. If your reservation has been made with us during this competition time, you will enjoy seeing the artists working. 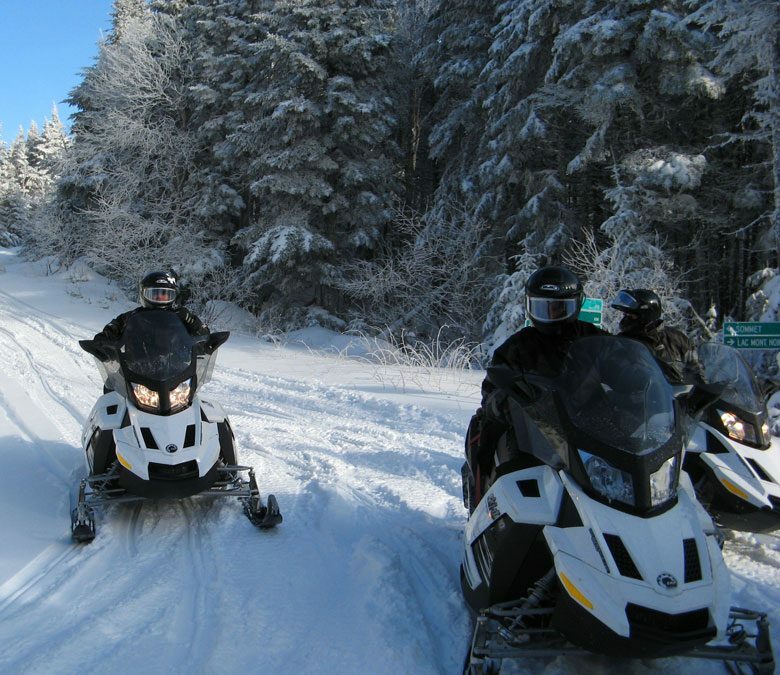 Option snowmobile mini raid 2 and 3 days : Leave for two days in total immersion with your guide. This snowmobile has comfortable seats, heated grips for driver and passenger and is a less expensive option in terms of gasoline. If you prefer a snowmobile with 90hp, you can rent the Bombardier 900 ACE, same but more powerful.